With Content Station 10, a user can automatically open a file for editing in its native application. Depending on what kind of file it is, installation and configuration steps are required. By default, articles are opened in the Print editor of Content Station but they can also be automatically opened in a pre-defined version of InCopy. 1 For Content Station 10.14 or older or when running Content Station in another Web browser, articles can only be opened in the Print editor of Content Station. For a proper communication with Smart Connection, one of the Enterprise Server instances that Smart Connection connects to needs to be defined. This is done in the configuration file of the Content Station plug-in on Enterprise Server. Step 1. Access the config.js file for Content Station 10. Step 2. Locate the serverName option and make sure that it matches one of the server names configured in the WWSettings.xml file distributed to your workstations. The process of opening the article from Content Station in InCopy is performed by the Content Station Desktop app. The version of InCopy in which the article should be opened can be defined in the Settings window of the app. Figure: The Settings window of the Content Station Desktop app. 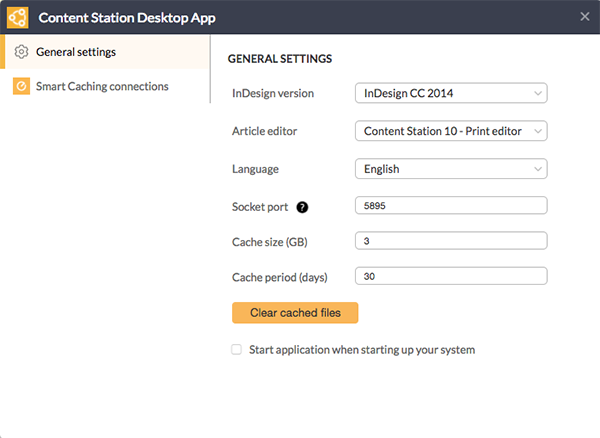 Make sure that the Content Station app is installed, correctly set up, and running. For more information, see Using the Desktop app of Content Station 10. These can be automatically opened in a pre-defined version of InDesign. 1 For Content Station 10.7 or older or when running Content Station in another Web browser, layouts can be opened by first downloading them and then opening them from the folder in which they were downloaded. The process of opening the layout from Content Station in InDesign is performed by the Content Station Desktop app. The version of InDesign in which the layout should be opened can be defined in the Settings window of the app. Files other than InDesign layouts or InCopy articles can be automatically opened from within Content Station. The application in which they are opened is the application that is configured on the system itself for opening that file type. 1 For Content Station 10.10 or older or when running Content Station in another Web browser, files can be opened by first downloading them and then opening them from the folder in which they were downloaded. The process of opening the file from Content Station is performed by the Content Station Desktop app. Make sure that the Content Station app is installed and running. No specific setup is required other than making sure that the Desktop app is started when the system itself is started up. For more information, see Using the Desktop app of Content Station 10. 10 August 2017: Updated the screenshot of the Desktop app. 25 July 2017: Updated the requirements with Adobe CC 2017 information. 14 July 2017: Added information about opening layouts created with InDesign CC 2017. 6 February 2017: Added information about opening articles in InCopy. 18 January 2017: Changed references of 'text editor' to 'Print editor'. 12 December 2016: Added information about the working of this feature for Content Station 10.11 or higher.